In higher education, reputation is paramount—but the concept of campus reputation is changing. Your reputation is in the hands of the general public. It’s what is said about you, not to you, that affects your reputation—for better or worse. Prospective students and alumni still discuss their thoughts about college around the dinner table, but their connected devices are poised to answer their questions about your institution. And they have confidence in their digital answers—6 in 10 people trust search engines over human editors. When you ask Google about an institution, the long-trusted rankings and news outlets don’t always make it to the top of a search. The seeker may find a blog post, podcast, or Reddit thread, because that’s what they want. What others see online is your reputation—and social listening enables you to gain a clear understanding of what the general population says about your campus, which influences others’ view of your campus. When you track changes over time in relation to your efforts to modify or improve campus reputation, you develop a reputation management strategy that works when the crowd overpowers the voice of rankings and journalists. In higher education, brand management is one of your institution's top priorities. With social media and the media molding the public’s perception of your brand, it’s your job to stay on top of your reputation—not just finding and analyzing online conversation, but also creating content that contributes to the conversation and aligns with your strategic goals. In order to know you're doing that, you need to understand the conversation about your brand using three key metrics: share of voice, owned vs. earned conversation, and brand attribute conversation. You can measure share of voice to understand how the online conversation about your brand compares to that of your competitors or peers. Share of voice is the percentage of conversations within a self-defined peer group that occur about your institution. If you want to improve your visibility among your peer group, it’s valuable to know the number of online conversations happening in your entire peer group. To calculate this, you can create search queries for each institution in your peer group and gather social listening data for a predetermined period of time. This compares the mentions of each institution as a whole. You can understand how your branded content contributes to total online conversation about your brand when you segment owned and earned content. 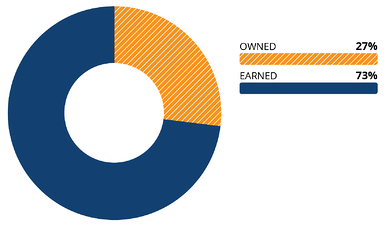 Owned content is the content you create for your branded accounts and websites, and the shares of this content by others. Earned content is the content about your brand that originates from non-branded sources (e.g., individual social media accounts, journalists, blogs, forums). This also includes the conversations individuals have with your branded social media accounts. Owned and earned conversation is generally expressed as a ratio or percentage. To calculate the owned/earned ratio and measure it on a regular basis, you can identify every single mention online as owned or earned. 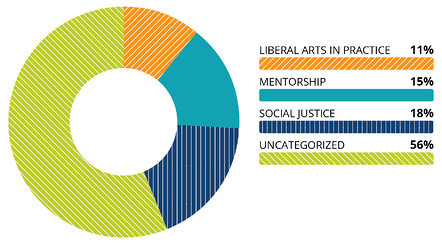 After analyzing a year of conversation for almost 100 campuses, we find about a third of the conversation is owned. However, we’ve seen it as low as three percent and as high as 70 percent. Low levels of owned conversation indicate that the campus isn't participating in (and therefore not influencing) the online conversation about them. This can happen when a crisis gets completely out of control, or when a campus chooses not to invest in creating online content and engaging in the online conversation. Assuming the earned conversation is accurately captured through social listening, high levels of owned conversation indicate that the campus essentially exists in an echo chamber—saying a lot of things about themselves without any reaction from the public. Well-defined brands have clearly defined brand attributes. In the past, whether or not brand attributes resonated with audiences was measured based on feelings and perceptions. Now that much of the conversation is online, we can quantify the growth of key brand attributes in brand conversation—and the sentiment of those conversations. Brand managers can use qualitative research methodology to develop a taxonomy related to their brand attributes to capture and categorize conversation that aligns with their attributes. Then, brand attribute conversation can be quantified as a percentage of all conversation, growth of each attribute can be measured over time, and sentiment of each attribute can be scrutinized to identify opportunities to improve brand messaging. We partnered with Beloit College who identified three brand attributes: liberal arts in practice, mentorship, and social justice. Strategic categorization and online conversation tracking can provide their brand manager with quantifiable results that resonate with the Board of Trustees, and identify specific tactics or strategies that contribute to the increased conversation about each attribute. The Beloit College case study shares more about how they’re using social listening to guide brand strategy. Gain awareness of audiences' successes and struggles. Gather data that informs strategic campaigns. Track your institutions performance over time toward its goals. If one of your campus goals is to improve national brand recognition, let's walk through the data analysis process. Segmenting the conversation allows you to see what people are actually talking about in relation to your brand. You can segment athletics to focus on the rest of the conversation, alumni to determine how graduates relate to their alma mater, or prospective students to see what they share after a campus tour. The answers to questions like the following offer the opportunity to learn more about your audience. What percentage of online conversation is aligned with our top three brand priorities? Excluding athletics, how does the public perceive the campus? What would public conversation about our campus look like if we took athletics out? Emerging trends can help you understand where to dig further into the data. Look at how the conversation about your brand changes over time. Does it become more aligned with what you want your brand to look like? Think about a particular brand attribute, such as community, what are journalists writing about community in higher education? The last step is to determine real-world outcomes and impacts for your brand. Monitor the growth in volume and sentiment of online conversation specific to identified brand attributes. Refine media relations strategy to increase media coverage related to social justice (brand attribute). Determine if the non-athletics conversation is aligned with the desired campus brand. Campus brand and reputation are integral to your institution's success. Social listening supports data-driven, audience-centric strategies. To help you understand the inputs and analysis process, we created The Power of Social Listening. The three-page handout outlines a general strategic social listening approach, explains the strategic impact social listening can have on campus, and demonstrates the approach applied to specific campus goals. 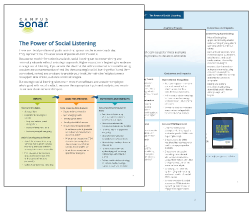 Download the handout and use it explain how social listening can benefit your campus.